I have some specific habits that keep things moving here (here being my business). One of those habits is creating my daily to-do list. I’ve noticed that the days that go a little off the rail (or a lot) are the days that I haven’t created one. When I have my list I have a visual reminder of what I am focusing on right now and that I will have an email and Facebook check later. I’ve also noticed it helps to create this list the evening before (it takes me longer to create this list in the morning). And, through a bit of trial and error, I know what format my daily to-do list needs to be in for it to be most helpful to me. But what works best for me might not work best for you. So, I put together a short list of different formats of daily to-do lists to share with you on Wednesday when I go live on Facebook. 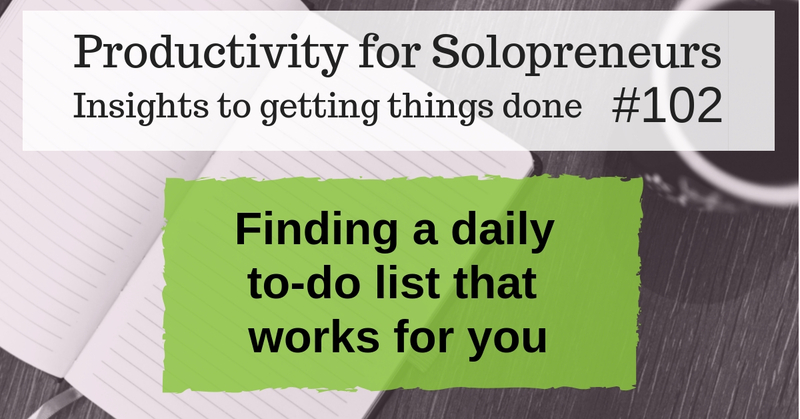 If daily to-do lists are not something that you do, I encourage you to attend on Wednesday (or watch the recording later) and see if one of the methods might work for you. Previous postWhat do you do when you’re overwhelmed, don’t know where to start, and don’t feel like you’re making progress?